To connect the GPS to the Raspberry PI we’re going to use the GPIO. The following table shows the GPIO PINs for RPI version B where to connect the GPS Pins. To connect the GPS EM-406A I had to buy a JST SH Jumper 6 cable – with 6 pins to fit in the GPS – although we only need 4 pins. I’ve used the RPI version B+ for this GPS. No explanation – just because at this time the B+ was the only one I had available. Both PINs in RPI B or B+ are the same and the wiring is also the same. The only thing changing is the GPIO of RPI B+. As soon you have a prompt available, it is necessary to change some configurations. The UART port, by default, is used for logins. We need to free it for the GPS. Now you should have GPS in your PI. But lets not stop here and create a map of the RPI locations. It wont do us any good if the have a GPS in the RPI and not create some fancy map with it. By installing the GPS applications, we also get some python modules. Let’s use those to get some info from the GPS. 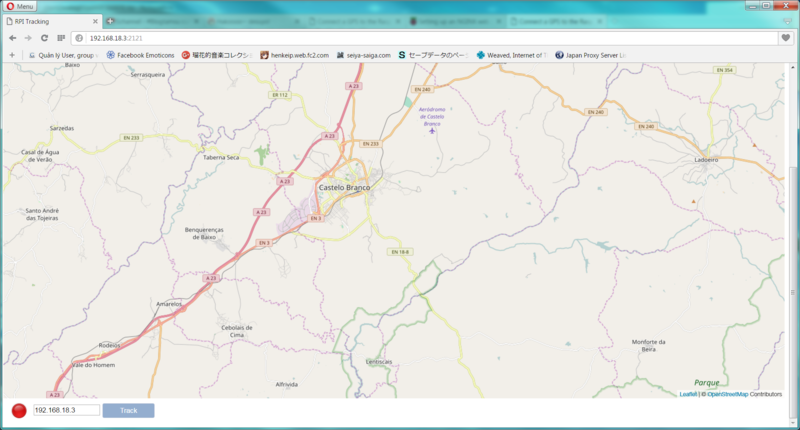 My solution was with a Web server, the python app reporting the coordinates to a text file and a Web application in another computer (or in the PI – more on that later) getting them and creating a map with PHP and Ajax. This is the first time I’m working with nginx. I decided to use it because is much less resource hungry than apache. For security concerns, lets change nginx listening port. Instead of 80, lets use 2121 (for example). Since nginx runs with the www-data group, lets add the PI (or your user) to the group because of permissions – we want nginx to be able to read and create files. All the code is in my bitbucket account (with Portuguese comments). The directory contains a file named gpswww.py .This file is to keep in the RPI, wherever you want, but you must later create a www directory (accessible by nginx) – where the this script will put the file coords.txt that will contain the current coordinates. For informations about gpsd Python modules, visit the page. In this computer is necessary to install a Web server (with PHP support) and Internet access so it can display the maps. In the bitbuck account you can find all the necessary files. In a browser, execute the file RPITracking.html and wait for the markers to start appearing with your RPI position. In this version I used markers instead of a line. I get it that after a while it gets messy and confused… In a newer version I’ll use a line. To work, the files you would put in the computer, put them in the RPI and you should get the map working. As you have configured the nginx document_root, that’s were you need to put the files. A side note – and since everything is in the same place, there was no need to use CURL – on PHP – to get the coordinates, but it will do no warm and it will work. For all this to work, the RPI is needed to work on batteries. In my case, I’m using LIPO batteries – with 2h and 30m duration – which is not bad…for now is enough . With the mini-usb cable, you connect all to the RPI. I believe is not the most efficient way to power the RPI, but after a few days reading, it’s all I came up. I’m not an electronics expert and if there’s some one out there with a better idea, please come forward ! We can save about 20mA (more or less) turning off the PAL/HDMI output (assuming we’re not going to use it) . This project (for now) as the downside that, in the computer used to view the maps, an Internet connection is necessary – because of the maps. There’s another reason that, both computers must be in the same network. I’m exploring XBees. The models I’ve purchased have 1.5km range – updates after some testing. Hope you like it. Errors or mistakes, please advise ! Could we use a offline google map for this project ? Could you please tell me about the accurate rate of both GPS device you have mention ? 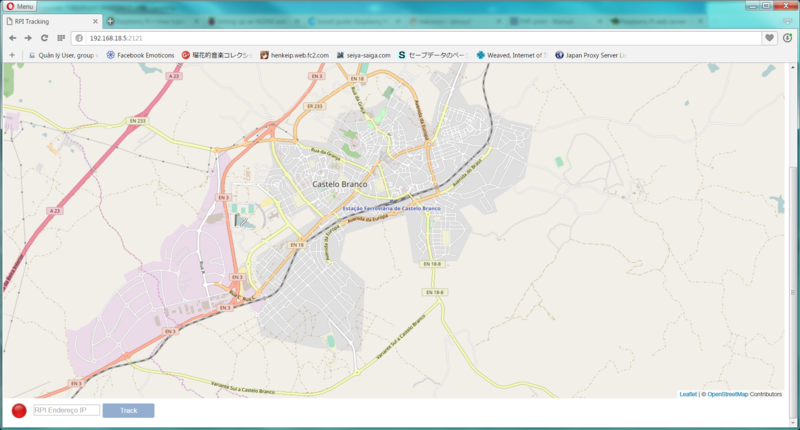 I’ve used OpenStreetMaps for this project to run away from Google Maps. I’ve tried hard to search for a solution to Offline maps, but I couldn’t find any that I could make it work. I’m due to review this project and try again for a offline maps solution. For the accuracy of these GPS, I believe they are in the order of 3-4m . Can’t be sure right now, but is within these figures. Did you restart ngynx after you change the port ? what information need for please helpme? What problems are those ? i dont know what must i do to starting this proses…….. your tutorial i was try… so how to see result this progam?? Can you get GPS fix ? You can check that with the small utility cgps . it’s tell that no such file ‘/coords.text’. how to fix this problem. It’s a file that should be available in the directory, but it should have been created if it not exists. This is in the file gpswww.py (on the RPi). Hope it helps. Let me know if you need anything more ! i already add the plus sign and its worked. That appears to me is a problem with the Python libraries for the gpsd. Are you getting a lock for the gps ? Yes, gps already lock and i get gps data when i run code cgps -s.
what do you mean another version of the gpsd daemon? Like I said, after a few searches, that appears to me to be a problem with the gpsd python libraries, hence I recommended you to try another version of the gpsd, but I guess that’s the latest version. Have you manage to sort that problem ? In addition: previously, chmod g+s www returned a result chmod: No such file or directory. The code in the bitbucket account is changed – there is no more w, just w+ ! I’ll change the code in the post. Hi there, so I’ve got the gpswww.py file as well as the php and html scripts in the /home/pi/gps/www folder on the Raspberry Pi. My coords.txt file is getting updated with my co-ordinates of my location. However, when I navigate to the Pi IP address:2121, a map is displayed, however, the button “track” after entering the pi’s IP seems to be greyed out. In addition, no markers are appearing at my location. As soon I have time, I’ll look into it and try to figure why it’s grayed out. Nonetheless, you have a developer console in any browser that you can invoke and see any errors that may be happening and if you want, post them here. I need some helps. I have followed the tutorial but I cant find the inittab file on /etc directory. What should I do ? You should have an /etc directory … What distribution are you using ? There’s sort of a bug in the map that I need to fix – a long time it is to fix . Try to center the map at YOUR location. When starting, the map is at Castelo Branco@Portugal. what data inside the file. is it possible to use this GPS also as a precise time source? Can you please also add this part in your tutorial? In the box next to the red button, put the Raspberry PI IP address and press track (the box comment is in Portuguese… I need to change that ! I try and put the Pi IP to that “box” already then click “track” but no luck It’s still red and I cant see the marker !_! I see you’re using the Raspberry PI to display the map. Can you ping the RPi IP ? i did type in the ip addres and pressed track The light is green beside the ip address. But no markers visible in the map. I change the original position in portugal to my position, but no gps markers in the map. Hello Samuel ! Thank you for the comment. Thanks for this great tutorial. I am using the following GPS, similar to the one used in the tutorial. How do I “change the /etc/inittab file” ? I have followed all the other steps in the tutorial and also installed the GPS applications. I get the table with all the rows, Time, Latitude, Longitude, Speed, Heading etc. But next to each heading it states n/a. First: are you wiring it correctly ? RX from GPS goes to TX from RPi and TX from GPS goes to RX from RPi. Second: are you outside so your GPS can pick up satellites ? Third: About the /etc/inittab file – can you locate the file ? You just need to comment a line, as explained in the tutorial. Is the file there? What distribution are you using ? This was done with Raspbian available in 2014 – Wheezy – have to check now ! Sorry for the late reply. I have been following your tutorial. How do I change this file or where is it located? When I run the /etc/inittab command, I get a error message stating ” No such file or directory”. Could you tell me what I may be doing wrong? I think since I am not able to change this file, the GPS is giving me no reading s for values. How else can I change or create this file and in which folder should it be located? inittab is not a command, is a file. You have to edit it. The /etc/inittab is just the path. The file is located in etc directory. The full command should be (without the quotes) “sudo vi /etc/inittab” or “sudo nano /etc/inittab” . Reminder: This was for a older version of raspbian and using sysVinit. Newer versions (like sketch) use systemd, hence the missing of the file. You can use raspi-config, go for option 5 (interfacing options) and then option P6 (Serial) and disable the login shell over serial and see if it works. gsudo is not installed by default . What you should be using is sudo and not gsudo.. It was a typo.. My mistake..
First of all i like to congratulate for this wonderful project its great!